Now through October 5th, Amazon is hosting a 30 Days of Savings Event and offering up different flash deals on select snacks and drinks each day. This is a great way to stock your pantry on the cheap without leaving your couch! 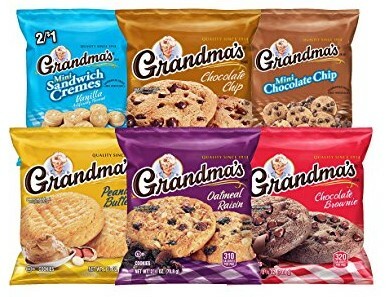 For a limited time, you can save on this Grandma's Cookies Variety Pack and if you're an Amazon Prime member, you can save on this Quaker Chewy Dipps 48-count Variety Pack. Final Cost $9.74 shipped – just 32¢ per cookie! This variety pack includes 8 Mini Vanilla Sandwich Cremes, 4 Mini Chocolate Chip Cookies, 6 Big Chocolate Chip cookies, 4 Big Peanut Butter cookies, 6 Big Chocolate Brownie cookies, and 2 Big Oatmeal Raisin cookies! This variety pack includes 22 chocolate chip, 22 peanut butter chocolate chip, and 14 dark chocolatey flavor Chewy Dipps granola bars.